3 months on and the project is very much nearing completion with handover of the first phase (main sanctuary, refurbished vestibule and rear extension) handover expected in June, with normal services commencing in July. The remaining work will aim for side extension completion towards the end of September. At this point we are focussing on planning for re-entry with various practical issues such as fire assessments, cleaning and the logistics of returning equipment back to the church so that it is ready for service. There are a number of events being planned for coming months to celebrate and give thanks to God for the new building details of which will be posted in due course. In the mean time we look forward to welcoming you back to Bellevue Chapel on Sunday 1st of July. There has been much progress in the building project over the winter months. Some work is visible and others behind the scenes or indeed underground. The vestibule area has taken shape with the framework for the the new toilets and office in place with the associated underground plumbing work. The wall under the balcony has been moved slightly forward with new supporting beams in place. In the rear area, much work has been done to take down and then rebuild the larger space accommodating toilets, storage and access to the new extension and the enlarged upstairs area. The framework of the upstairs rooms is taking shape and in March, we can expect to see the new roof beams emerging to create the large upstairs space. There will be another small toilet upstairs. The increased number of toilets is not entirely by choice but more by the requirements of the Building Control officer. There should be no more queues for toilets! The new side extension has had the foundation laid, albeit much deeper than expected. The concrete foundation has been poured and through March, the steelwork to form the shape of the new extension will begin to appear. Despite all the good progress, we are running later than planned. 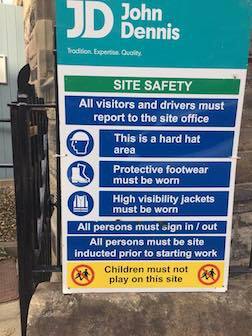 The builders have advised that we should expect to be back in the main sanctuary, vestibule and rear extension spaces during June. The side extension will take a bit longer and the builders have indicated that it is likely to be available in September. However, we anticipate being able to move all our activities back in to Bellevue over the summer period, exact dates to be confirmed. We are working to extend the temporary accommodation arrangements we have in place for the church activities. We are taking the opportunity to improve some items which we would have to replace in the next few years, such as a new central heating boiler and significant repairs to the exterior of the rose window stonework. These will incur costs over and above the original budget, so your ongoing giving to the project is still required and greatly appreciated. After some delay over the summer period caused by various issues with the technical specification, building control and holidays, we can confirm that a contract has now been signed and the keys of the church have been passed over to John Dennis the chosen contractor. Their team will start the site set up w/c 18 September and then the full team will be on site w/c 25 September. John Dennis will be responsible for all communications with our neighbours regarding the building works. There is unlikely to be a flurry of activity in and around the church over the first few weeks. Site set up includes getting the permits arranged for using the pavement, finalising site investigations and ordering materials, and there will be stripping out of internal finishes and partitions as they are starting internally rather than the side extension.However work will be progressing. 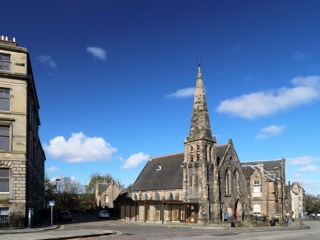 Now the keys have been handed over, members are reminded that we should not be accessing the church building unless it is pre-arranged and agreed with the contractor. It becomes their site and their responsibility. The revised program has completion estimated by July 2018 although we are working on trying to get earlier entry to everything but the new hall extension around springtime if the programme goes to plan. We will keep you updated with progress in due course. At our annual general meeting Alan Paterson shared an update on the progress of the extension work. A copy of the PowerPoint slides shared at this meeting can be downloaded by clicking here. At this point a number of contractors have already been on-site to gather the information they require to provide a price for the job. Following this a decision will be taken by the steering group as to who to appoint. In addition the interior designers have submitted proposals for potential design schemes for the new facilities. Work is still on-going to identify suitable alternative accommodation for our regular activities however the exact degree of disruption will not be known until a main contractor has been appointed and contracts negotiated. Considerable progress has been made on the church building project over the last couple of months. Many meetings have taken place, including a significant meeting of the Steering Group with the whole of the professional team involved in the development. Partners and senior staff from the architects, quantity surveyors, structural engineers and the interior design consultants were all present. The Working Group continues to meet and has produced a “brief” for the interior design consultant, indicating how the individual rooms will be used and the type of “look and feel” we seek to achieve. Information was delivered to the quantity surveyors on Friday 10 March 2017 and work on the Bill of Quantities is now progressing. The Bill of Quantities is a detailed specification of the work to be done and the materials to be used and this will be supplied to each of the potential main contractors as a basis for their tender submission. Detailed work has also been done on the PA and AV requirements for all the rooms in the extended building and a detailed plan has been submitted to the architect for incorporation in the overall design. A number of contractors, capable of doing the work have been approached and a shortlist of four has been drawn up with a fifth held in reserve. They will each be asked to submit a price for the work and a final decision on the successful contractor will be based upon their price, availability to start the work when required and the site team they will supply. It is anticipated the tender documents will be provided to the shortlist contractors towards the end of April with a desire to have the selected builders on site towards the end of June. The architects anticipate the project will take eight months to complete, but every effort will be made to reduce this when the selected contractor develops their programme of works. Planning for the disruption during the construction period is ongoing and a number of possible alternative venues for the midweek activities have been visited. More detailed arrangements will be made over the coming months. The planning application to extend the premises to provide accommodation for the growing work with children and young people was, in the providence of God, granted by the Local Authority without there being any objection from the local community. 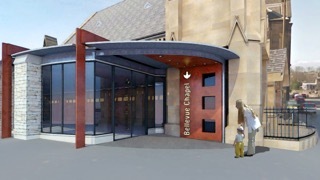 Re-modelling the existing main entrance and facilities at either side of the existing front door. Adding the large side extension on Cornwallis Place. Re-configuring the rear of the building to create extra space on the ground and first floors. Since receiving approval the Architects have been working on further details of the scheme including producing detailed drawings. These are required to be submitted to the Authority in order to obtain the Building Warrants. Consent will confirm the works are in accordance with all relevant regulations and meet the latest building standards. The Architects submitted application for Building Warrants on 23rd January 2017. It will take several weeks for a response to be received. During this period work continues particularly by the Quantity Surveyors who will prepare a Bill of Quantities outlining all the necessary steps in the building process and calculating quantities of materials required to do the work. It is from this schedule the contractors will tender their best price for the construction. The anticipated timescale to going out to tender is probably 7- 8 weeks. In the meantime, the Bellevue Chapel Working Group has begun to meet initially to review the provision being made in the additional space; to suggest additional features to make the accommodation suited to the needs of a growing church; to prepare for the period when contractors are on site when parts, and at times all, of the building are out of use and the importance of keeping the church family, and our neighbours, informed of progress. Details of those involved in the working group can be found in the box above. Please feel free to contact any of them if you have any enquiries.